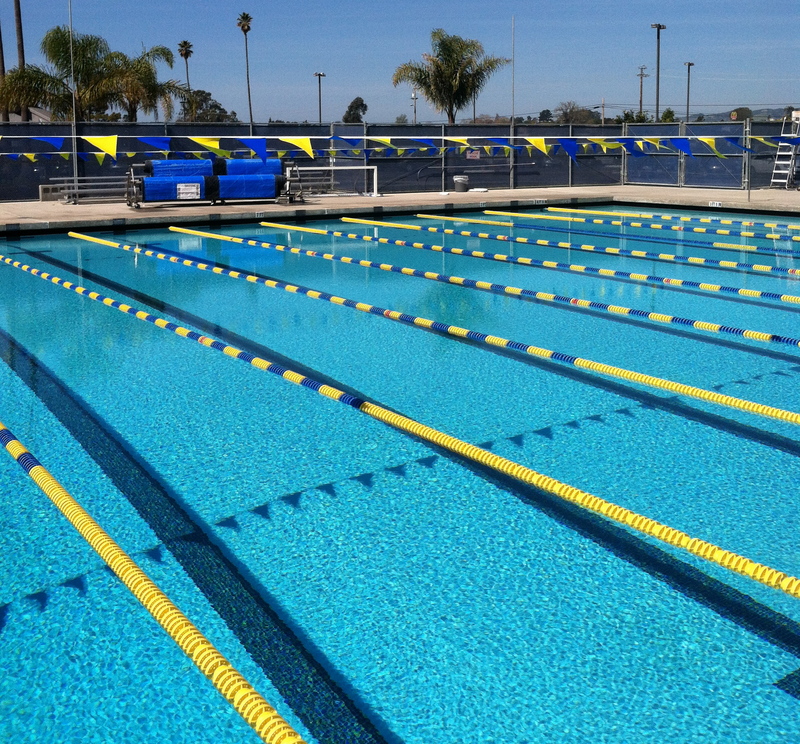 The Arroyo Grande HS Aquatic Center will host the Pac-8 Swimming and Diving Championships this week. The Pac-8 League Swimming and Diving Championships will be held at Arroyo Grande high school this week. The competition will begin on Monday with the diving finals. Seventeen girls and seven boys will begin the 11-round event at 1:00pm. On the girls side, Arroyo Grande’s Alyssa Shallanberger will look to defend her title, while San Luis Obispo’s Blake Griffith will look to do the same on the boys side. On Tuesday, the girls preliminaries will be contested, and the boys will follow on Wednesday. The top 16 swimmers in each event after the preliminaries will advance to the finals. The final will be held on Thursday. All swimming sessions are slated to starts at 3:00pm. Just over 400 swimmers will be competing. In the team races, the Arroyo Grande boys and girls will both look to win a third straight league title. Both teams enter the meet with unblemished league meet records of 7-0, and both have had successful showings at invitationals. The girls placed fourth at the Clovis West Invitational, a meet that attracts the top talent from the Central Section as well as teams from the southern section. The boys placed third at the Winterfest Championships, which was held in March, as well as the Spring High School Meet of Champions in April. Both meets were hosted by Mt. San Antonio College in Walnut, CA. Both teams are seeded first in all three relays heading into the Pac-8 meet. Both Arroyo Grande teams have won league titles in each of the past two years. The girls went undefeated in 2014 and won the league meet easily, then went undefeated but narrowly lost the league meet to San Luis Obispo last season, earning them a co-championship. The boys won their first ever league title in 2014, and won again last year. Both titles were undefeated landslide victories. There will be a number of epic individual battles as well. In the girls meet, Arroyo Grande’s Hannah Parson will look to defend her titles from last year in both the 200 and 100 freestyles. Parson is the top seed in each with times of 1 minute, 57.46 seconds and 53.83, respectively. She will be challenged in the 200 by St. Joseph’s Jessi Van der Laan, who is seeded with a 2:01.00 but has posted a 1:55 in club competition, as well as Kasey Moffit of Paso Robles. Van der Laan is the top seed in the 500 freestyle with a time of 5:21.00 in what promises to be a very tight race. She is followed by a tight field of Moffit (5:22.32) Samantha Hazel of Arroyo Grande (5:22.54), Mackenzie Raymond of Paso Robles (5:22.82), and Adelynn Peterson of San Luis Obispo (5:23.80). Van der Laan has posted a 5:05 in club competition, and Peterson has gone 5:12 as well. Peterson is the top seed in the 100 butterfly with a time of 1:00.97. She is followed by Sarah Parson of Arroyo Grande, who has a seed time of 1:01.23. The two had an exciting race in the dual meet. Parson led for most of the race but was barely overtaken by Peterson on the final lap. In the boys side, Arroyo Grande’s Trent Schachter will look to defend his titles in the 100 fly and 100 back. He is the top seed in the 100 fly by a large margin with a 50.51. He is followed by his teammate Charlie Watkins, who has gone 54.20. Schachter is also the top seed in the 100 backstroke with a 52.32. He is followed by Paso Robles Joshua Dewhurst (53.58) and San Luis Obispo’s Galen Penvenne (53.85). Charlie Watkins is the fourth seed with a 55.59, but he went 53.50 in the event last year and figures to challenge the top three seeds. Righetti’s Austin Nims is the first seed in two events. He tops the psych sheets in the 200 individual medley with a 1:59.56. He is followed by Penvenne (2:00.17), who won the event last year, and Arroyo Grande’s Kevin Virnig (2:02.82). Nims is also the top seed in the 100 breaststroke with a 1:01.60. He is trailed closely by three Arroyo Grande swimmers, Peter Fletcher (1:01.67), Josh Smith (1:01.97), and Virnig (1:03.08). Jack Alexander of Arroyo Grande is the top seed in two events, the 50 and 100 freestyles. In the 50 he tops the rankings with a 21.50. He is followed by two Atascadero swimmers Sean Mylan (22.05) and Scott Beraud (22.77). In the 100 he is seeded with a 47.71. His teammate Chris Dichmann is the second seed with a 48.11. The meet is also the final chance for Pac-8 swimmers to qualify for the CIF-SS Division 2 championships which will be held at Riverside City College on May 13-14.